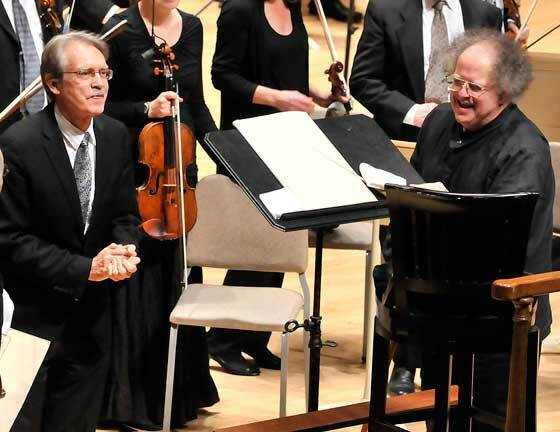 The Boston Symphony Orchestra under James Levine continued its Harbison and Schumann symphony cycles on Black Friday, November 26, with the former’s First and the latter’s Third in E flat (the Rhenish), and tied the bundle with Levine’s first BSO performance of the Prelude and Love-Death from Wagner’s Tristan und Isolde. The program order — Schumann before intermission, Harbison and Wagner afterwards — seemed at first blush a bit counter-intuitive, susceptible to gaming by whatever remaining diehard enemies of modern music willing to sacrifice half of a pricey ticket to demonstrate discontent. However, in the event, though we did notice a few AWOL after intermission, the audience pretty well kept together, to its pleasure. Schumann’s Rhenish Symphony (not the composer’s title, though it is certainly apt) is possibly his most popular; it is certainly his most thoroughly extroverted and the most overtly programmatic of his four numbered symphonies. Our own experience of it was formed without reference to the program, so we are always a bit bemused by the specific references, especially in the fourth movement (of five), which is the most elaborately detailed in depicting the ceremony elevating the Roman Catholic Bishop of Cologne to the rank of Cardinal. The programmatic aspects of the rest of the symphony are more closely related to the mood-painting of Beethoven’s Pastorale symphony (to which the Rhenish is often compared in that respect, as well as in some specific musical connections), which makes them more universally appreciable. Levine’s approach, especially to the first and last movements with their manic cheerfulness, was to emphasize the big lines and gestures. This is understandable, since Schumann gave little opportunity for subtlety in dynamics or tempo; there are very few passages below forte, nor is there a single letup in the tempo. What Levine could do, and did quite successfully, was to shape lines and phrases with abrupt crescendo at their beginnings. The second movement’s intended rusticity (we prefer to hear it as a rocking Rhine boat ride, as it’s taken at a gemütlich moderato) is carefully complicated by delicious cross-rhythms, in which Levine delighted and which he pointedly emphasized. This is meant to contrast with the more urbane pastoralism, if you’ll pardon the oxymoron, of the third movement, so decorous in phrasing, so Mendelssohnian (and anachronistically even Sullivanesque) in sound. The fourth movement introduces a note of solemnity, as per its program, but also as a perfect aesthetic counterpoise to the others, culminating in a sonorous brass chorale, following Levine’s careful pacing. We should take this opportunity to praise the brasses and winds, who contributed much, not only by Schumann’s design but by their nearly flawless mellowness and roundness, to the success of this performance. Praise is due in particular to Principal Trumpet Thomas Rolfs, whose military tattoos in the finale were as tightly clipped as a Marine coiffure. The finale returned to the celebratory and robust mood of the opening movement, and here Mr. Levine kept matters under tight control, carefully pointing up Schumann’s many but often oblique cross-references to material of earlier movements, up to the last and not at all oblique return of the chorale. We were, however, left musing on the secret codes that must flit between conductor and orchestra, since Levine’s soaring stick made us wonder how mere mortals could ascertain the beat, while his very clearly communicated expressive gestures elicited a distinct delay before their nevertheless uniform execution. It’s as if he were saying, “do this; but not quite yet,” and yet the meaning of “quite” was distinctly understood. The BSO has been extremely helpful in promoting and preparing the audience for its Harbison cycle — not, we hasten to add, because the music is particularly forbidding; quite the opposite — with copious program essays and the composer’s notes on the individual pieces, but also online with analyses, such as this one on the First Symphony, and a charming originally live and now archived interview and Q&A with Harbison, on the same page. (Click on the BSO Media Center link — it’s a Flash player and we can’t link directly to it.) By committing to create a body of work taking on the title and substance of “symphony,” as few contemporary composers have, Harbison has asserted in audible ways that a composer does not have to reinvent the wheel to be an individual and can stand in solidarity with Western musical tradition without being suffocated by it. In a nutshell, the “shtick” of Harbison’s First (which he boldly gave its ordinal designation when he wrote it back in 1981) is a series of chords that open it, mined, as he tells it, from a dream, and which we’ll therefore call the “dream chords.” These hammered chords in the brass and percussion carry a descending bass line, which together or separately provide much of the pitch materials for the work and inform the manner in which the themes derived from them are manipulated. The harshness of the opening of the first movement (we were actually a little reminded of the Vaughan Williams Fourth) is then mitigated somewhat by a Stravinskyan chorale-like passage in the winds, then much more so by a lyrical theme for strings and flute. Throughout much of this movement, and recurring in later movements, is the descending bass line from the dream chords, sometimes more in mood than literal repetition. Thus there is a continuous sense of development, not just in what passes for a sonata-form development section, and through the repetition of all the main materials in recapitulation. The second movement, a very short and fleet-footed scherzoid, features babbling winds often undercut by ominous brass (how appropriate for Black Friday, then, that all the works played were, as the big-band leaders termed it, “black in the brass”), followed by a more relaxed “trio” which then had no da capo section. The slow movement opened with an eloquent string passage followed by a lovely tune for English horn (Robert Sheena in elegant voice), with various accompaniments until the main string melody sneaks in as accompaniment and then takes over its leading role. Intensity builds to a noisy brass chorale that gradually subsides. The fourth movement casts off the shadows in the grand American tradition of jazzy finales — it’s what we do, it seems. There are hints of William Schuman and Leonard Bernstein, but the spirit that clearly hovers over it is Gershwin, whose music Harbison was playing, per his program note, a good deal of at the time. In the interview mentioned above, Harbison described his early studies in Germany, and recounted how the professionally alienated musical fashionistas sneeringly told him he “couldn’t do” things like imitative voicing any more. Well, we detected in this movement an actual cycle of fifths, which you certainly can’t do in Darmstadt, but which work just fine in our less uptight precincts. Harbison’s First, like his Fifth and his to-be-completed Sixth, was a BSO commission, but this was Levine’s first crack at on the home field. His reading was full of snap, crackle and pop, and in this case gesture and execution were perfectly simultaneous. Not enough gets said about Harbison’s brilliant way with instrumental color; the outstanding performances by the BSO players, especially the percussion and brass, made it impressively clear. It was a thoroughly persuasive performance that was, along with the composer, very warmly received by the substantially capacity audience. Levine ended the program, after two big-bang outgoing symphonies, with the exquisite and anguished inner world of the ever-longing lovers in Wagner’s Tristan und Isolde. In Levine’s reading, the Prelude seemed suspended in air, each twining chromatic phrase fading in and out in almost Webernesque evanescence. The final pizzicato of the basses was scarcely audible, a thrilling moment. The Love-Death, that apotheosis of the apoggiatura, grew and swelled in agonizing harmonic suspense. Levine used a Toscanini-like gesture of his left hand on his chest to elicit ever greater vibrato from the violins as he built the great crescendo, which finally released and achieved resolution through the heroine’s death and posthumous union with her lover. Levine, opera man that he is, appeared to relive every nuance of the whole opera’s stage action, bringing the orchestra and audience fully with him. The playing was, of course, superb. One final note: Someone in authority, we don’t know who, has decreed that the orchestra members should turn to face the audience to receive its applause (or whatever) at the beginning of the concert and after each piece. We think this is highly salubrious. Having literally faced the music while performing, it seems reasonable that they figuratively do so afterwards. Considering that 99.99 percent of the time what they’re facing is enthusiastic applause, we think (don’t you?) that they could at least smile. They’ll get further chances to do so with this program on Saturday, November 27, and Tuesday November 30. Maybe they don’t smile because every second they’re trapped by the applause is a second of delay in heading for home or wherever they’re going after the show. And making them stand just prolongs the ovation/delay. I really enjoyed the Schumann and Harbison pieces. And it was very kind of them to put the Wagner at the end. I was able to duck out after the ovation for John Harbison, do an errand at the Pru, and still get home sooner than if I had stayed through the Wagner. I like to say of Wagner, that if he had only confined his composing to instrumental music, he could have won the enduring fame of John Philip Sousa. But the “Tristan” Prelude and Liebestod wouldn’t have done it. IMO they’re as bad as Brahms, maybe even worse. Really tedious. I want to hear the Harbison symphony again. A half-time feature on the radio Saturday evening with Brian Bell and John Harbison suggested that the fourth movement had Haydnesque qualities, and I sorta know what they mean. But I’d like another go-round with the whole thing to see what I missed in the first hearing. Fortunately it looks as if I’m free Tuesday evening. Sounds like it was a great perormance. Wish I could see Mr. Levine conduct one day. Great job of using a William Schwenck Gilbert quote in there as well. I’m still on “cloud 9” after tonight’s BSO concert. Levine was in fine form and the orchestra played with technical brilliance throughout… rarely has the brass section sounded so spectacular. How rewarding to hear the Schumann # 3 done in such a loving manner. I went for a second hearing of the Harbison First Symphony last evening, and I am as pleased as Ed Burke. Yes, the “Rhenish” was near perfection to this non-critic, non-musicologist’s ears. The brasses (with what sounded like only one stray note in the whole piece) were on a par with their glorious work in last season’s Beethoven Sixth, and the whole orchestra seemed flawless. But I am even more pleased to have heard the Harbison First again. During the performance on Friday, what really surprised and delighted me was the verve of the fourth movement. On rehearing, the first three movements opened up to me in a way that they hadn’t on first hearing, and I could better appreciate and truly enjoy their musicality.